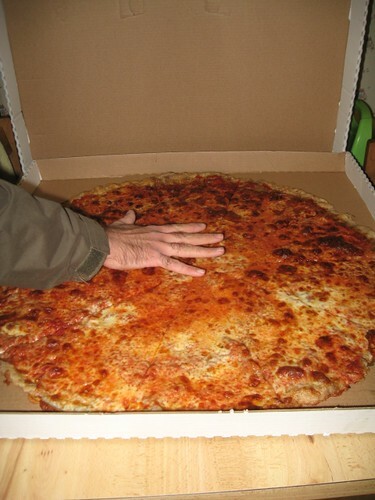 Have you ever seen a 30 inch pizza before? No really, I am being serious. Such a beast really does exist, and not simply on Food Network for an eating challenge. We recently found a new pizza place that is really cute. The people there are very nice and the best part, they make wheat pizza. My mother called last Friday to see if we wanted to have dinner with her and order a wheat pizza since my father was working late. We said sure and figured we would try an experiment. Since there were five of us eating the pizza, and left overs would be great, we opted to order the Big Mama. After walking in to pick up the pizza, we wondered if it may have been a rather large mistake (pun intended). 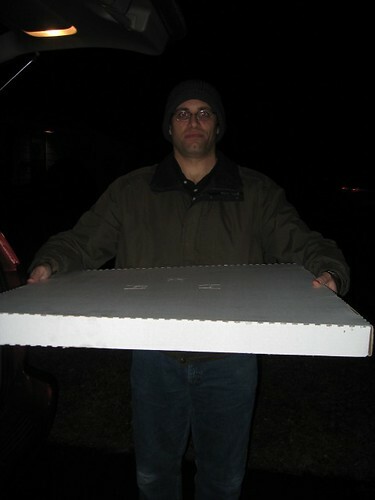 The pizza finally arrived safely at my parent’s house. Then another drama unfolded thanks to the size of the box. JL had to figure out how to get the box into the kitchen through the door frames. 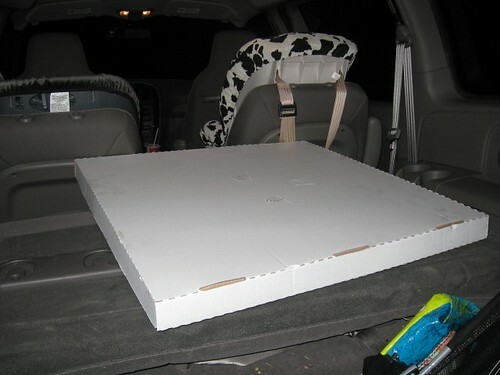 Once on the table (where it took up the entire space) we could finally look inside the book to view our Big Mama pizza. Lesson learned from this experience is that in the future we will leave Big Mama slice eating to the restaurant. We will not be taking home another one of these puppies any time soon. OH! Yummmmm! That looks fantastically funny! That thing is huuuuge! How did you get it in the house, through a double sliding door? lol. how funny! It barely fit through the door to my in-law’s house. It actually didn’t fit through one of the kitchen doorways. Luckily, the second doorway was a tiny bit wider and allowed it through.